As we left Kashgar for Osh in Kyrgyzstan I expected a long but fairly uneventful travel day. The reality didn’t deviate too much from my expectations but even with that the experience couldn’t have been further from mundane. 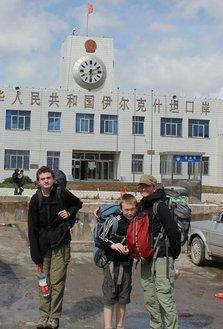 It started when the Chinese taxi driver dropped us at the China-side border post. The broad two-story building looked like an architectural joke, like someone had been designing a building for downtown Urumqi and then, on a whim, had placed it instead in the mud on top of a mountain pass. The soldier gating the entrance checked out passports and waved us inside. That was Passport Check #1. We had completed exit cards in our passports but the next guard gave them only a cursory glance before handing us new ones to fill out. Oh! The joys of endless mindless border-crossing paperwork. As we scribbled our names and passport numbers he unveiled and started up an ATM-like machine in the corner. Our passports and new exit cards were scanned one by one with a robo-voice dictating machine operating instructions loudly in English each time. That was the very odd Passport Check #2. Next up was the bag scan – with a side of checking passports (#4) thrown in. I had a suspicion that the unopened box of tampons in my bag might cause questions so I went last – not wanting to be standing between BigB and CAM as I possibly had to explain what they were for to the young male guard. My bag went through the scanner and, surprise, surprise, it had to be opened. On the first pass he flagged my portable hard drive. Next time through it was my bag of Starbucks Via (me: “Coffee”; him, smiling: “Oh”) and the tampons (me: waiting to see what he’d ask; him: turned the box over, opened it, an embarrassed flush, move on). After the third scan I was good to go. Only two more passport checks: once by the guard who collected the exit form and stamped us out of China and once by the guard manning the door out of the building. Whew. Be warned if you ever plan to enter or leave China via Irkeshtam Pass. Pack your patience and expect your passport and visa to be checked many times. That we’d safely exited China with one last flourish of Chinese bureaucracy was apparent. How to get to and cross into Kyrgyzstan was not. This wasn’t a friendly neighbor side-by-side exit and entry border post. The exit guard gestured to us to sit down and wait, so we did. 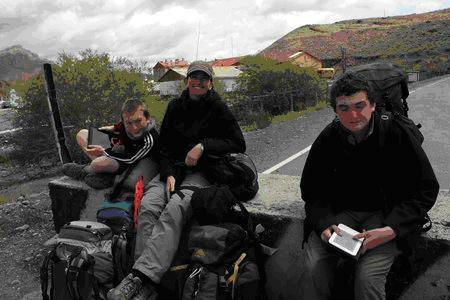 “How do we get to Kyrgyzstan?”, CAM asked. This kind of situation, where we sit and wait without a real clue of how or what the next step will be is really, really difficult for our older child. My husband’s patience with nagging questions from his anxious teenage son is medal-worthy. CAM harrumphed into a corner and took out his kindle. “Sweet Jesus, give me patience”, I thought as I passed back the bag of bread. A local came through passport control. His papers were checked as many times as ours had been. It was good to know we didn’t get any special treatment. “It must take hours to process a bus-load of people”, Murph observed. I nodded, silently glad that we’d opted not to take the public bus from Osh to Kashgar. The exit guard led the local man outside and flagged down a truck that had just come through the vehicle checkpoint. The man climbed into the cab and the truck drove off. I turned to Murph, who was reading: “Did you see that?”, I asked but before I could say anything else, the guard was motioning us to go outside. He flagged down two more trucks. Murph and CAM climbed into one, BigB and I into the other. The first truck drove off but our driver – who did not look like a very happy honey – pulled his truck in, parked and disappeared into the building. More waiting. Now I was starting to get worried – our passports were in Murph’s pocket! It was a good 10 minutes before the truck driver returned. I tried smiling and saying “A Salam Aleikum” cheerfully but all I got was a grunted reply. Well, I’m sorry for invading your personal space, bud, if you have a better way for getting me and my impressively-patient 10-year-old to the Kyrgyz side of the border, lay it on me, I’m all ears. (I didn’t actually say that). The rest of the steep, winding, barely paved ride was mostly in silence. “I bet your Dad is loving this”, I said to BigB knowing that this back-of-an-envelope, taking a lift from a random trucker was just the kind of unorthodox travel experience that Murph would love. Sure enough, as we arrived at the next checkpoint (still Chinese!) their truck was stopped and Murph was standing on the side of the road with a 100W grin on his face. He ran back with our passports. I explained that there should be someone waiting to pick us up. He pulled out his cell phone and called the number I’d been given. “Your driver is on his way”. “Is that Kyrgyz?”, I asked wondering how my husband had managed to learn how to say “Thank You” in Kyrgyz before we’d even crossed the border. I slapped myself on the forehead. Of course it was Russian. Kyrgyzstan. Ex-Soviet republic. Naturally the lingua franca was Russian. The car drove up and we climbed in. Anatolyi the driver, smiled around. “Sprechen Sie Deutsch?” he asked tentatively. Gulp. This was going to be interesting. This entry was posted in China, International Escapades and tagged China, China With Kids, Irkeshtam Pass on June 22, 2011 by wandermom. YOu are having the most amazing adventures! As I work each day and wait to retire so we can start travelling. Although I know I would not have the guts to try what you are doing! Keep going – this is neat to live vicariously! Thanks Rita – this comment made my day! I have found a kindred spirit! Hello! Last year we took our lads (7 and 9) for 2.5 months to Thailand & Laos; the trip included 2 days on a slowboat from the Thai border to Luang Prabang. This summer we spent 1.5 months in Georgia (Asia). There were some “100W” smiles abounding when we hitched a ride in the back of a cow transport van. Next up is Central America or China (I found your site when looking up family travel in China). And, just to spice it up a bit, we keep kosher when we travel! Keep enjoying your adventures.